The durably constructed Stanton STR8-50 Digital Turntable has an industry-leading 4.5 Kgf-cm torque motor, an ultra-stable platter, a skip-proof, straight tone arm, and minimizes feedback. Performance features include key correction, reverse, up to 50% pitch adjustment, quartz lock accuracy, and S/PDIF digital output. Controls include start/brake speed adjustment, selectable phono/line output, dual start/stop buttons, and a height-adjustable tone arm. 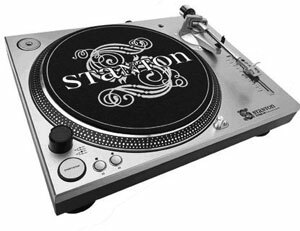 The DJ deck also includes Stanton 680HP cartridge, slip-mat, and cables. Stanton STR8-50 / STR850 owners manual, service manuals and schematics are for reference only and the Vinyl Engine bears no responsibility for errors or other inaccuracies. The PDF files are provided under strict licence. Reproduction without prior permission or for financial gain is strictly prohibited. This website is not affiliated with or sponsored by Stanton.